Rick Richter is CIO of Food for the Hungry. In this interview Rick explains why his organization is moving all of its computers to Ubuntu. 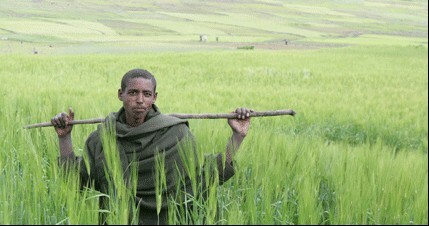 Ethiopian farmer Ato Admasu. Photo credit Food for the Hungry. Rick: Food for the Hungry is a Christian relief and development organization. We go in to relief situations—maybe there has been a natural disaster or war—and provide life-sustaining needs: food, shelter, whatever the need may be. For example, the recent earthquake in Haiti. But the other part of what we do is the sustained, long-term development on the community level. The idea is to work with leaders and churches to better take care of themselves rather than relying on outside organizations for support. I’m the CIO. I’m in charge of the information and technology for the organization. We’re in 25 countries. I have staff all over the world, about 25 people. There are about 12 who work directly for global IT, mostly in Phoenix, and the rest in various countries. There are also people who work directly for local offices, for example in Kenya, that coordinate with global IT. We’re responsible for about 900 computers. John: You and I were talking the other day about your organization’s project to move all its computers over to Ubuntu. 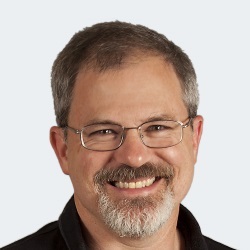 Rick: We started an informal process to convert to Ubuntu two and a half years ago. It started when my son went to Bangladesh. He spent the summer there and converted some of their computers to Ubuntu. At first we didn’t have full management support for the process. They don’t really understand it and it scares them. There were individual country directors interested in the project and I talked it up. There’s some independence in the organization to make those kind of decisions. Now, for the first time, we have full support of management for the conversion on a wide scale. I’m going to Cambodia next week. Right now they’re all running Windows but before I leave they’ll be running Ubuntu. In Asia we probably have about 80% of our computers on Ubuntu. We don’t have big offices in Asia. Our bigger offices are in Africa and they’re a little slower to adopt. Until now, a lot of it depended on whether the local country director was ready to change. We found it was important for a number of reasons. One is security. Linux is not as vulnerable to viruses. We have so many places where entire computer systems have been totally crippled because of viruses. A lot of networks are very primitive, so the network is basically a thumb drive between offices in a country. A thumb drive is the best way to transmit viruses you can find. We’ve also found in the last few years anti-virus software has become less and less effective. Three or four years ago, if you had up-to-date anti-virus software you wouldn’t get a virus. These days, you still get them. Some of our staff have other jobs within FH besides their IT responsibilities and may not have a lot of IT experience. As a result, staff often do not have the time to pro-actively manage IT. Another issue is maintainability. Windows computers don’t run as well over time. With Ubuntu, when we come back to a computer two years later it’s in as good a shape as we left it. Linux requires much less hardware to run than Windows. We have eight- or nine-year-old computers at a lot of our sites that will no longer run or barely run Windows. John: So saving money on software licenses is a benefit, but not the main consideration. Rick: Saving money on licenses is important, but it’s not the driving force. We’re a non-profit and we have a contract with Microsoft where we get pretty good prices. Another reason for moving to Ubuntu is that in some countries it is very difficult to legally obtain licenses. Sometimes it’s next to impossible. You can’t buy legal Microsoft licenses in some places, or if you can, the price is outrageous. So many legalities and so many weird hoops you have to jump through. As a Christian organization we need to set a good example and make sure all our licenses are legal. We want to be clear and up-front about our software. Ubuntu eliminates that problem. John: What experience have you had retraining your IT people to support Linux? Rick: We have IT professionals and we have people who are much less skilled. Most of the IT people who do the support have really bought into it. They’re excited about it and they’re pushing it. Those who do support in the field who have had less exposure, some of them have bought into it, some have not as much. It requires time. It requires dedication. It also required commitment from their management. I don’t know if this is all you asked, John, but I’d be very interested to know if they had any problems finding Linux software to do what they need. That was certainly a problem when I researched using Ubuntu in a corporate setting a couple years ago. I did ask about that. As I understand it, some people in accounting or advertising run commercial software, but the people in the field are fine with typical Ubuntu software. adario: I asked Rick about office software. I accidentally cut off that part of the interview, but maybe just as well. This way it’s not too long. But to your point, Rick said many of their users have not used Windows before, much less Microsoft Office. These people have no complaints because they have no point of comparison. Don’t forget that there is one even more important quality of Linux over Windows. Linux is free software (free meaning freedom). So Using Linux is like choosing democracy over dictature. That’s how you empower people for the future, instead of just few self-selected people who then have power over the people. And this is one extremely good cause for the best feature of all people. DigitalFreedom: I don’t want to put words in Rick’s mouth, but my impression is that he’s not concerned about open source per se. I think he’s simply looking for high-quality software without onerous licensing complications. The reasons for Food for the Hungry switching highlight many of the benefits of Linux over Windows. I was able to give my old computer running Windows XP new life by installing Ubuntu. It is much more speedy than even a clean install of Windows on the computer. Also, with Windows, every new version supports less an less old hardware. With Linux, it is easier to run Linux on older computers because they usually have support for older hardware. Even if a clean install doesn’t work that well, it is possible to install custom drivers or even make your own. With Linux, a person has nearly complete freedom with their OSs. It is easy to customize and it allows a person to do what they please with the Os assuming they know what they are doing. A while ago (2 years) I switched to Ubuntu because my old Windows XP PC was failing me. My friend said he could help and he installed a fresh install of Windows XP. It still lagged. Then he installed Ubuntu and made some modifications and my PC was reborn. I have not looked back ever. Need to ruun Microsoft Office? There’s wine. If we could get more details on this, targeting areas of interest in the comments here, it would be a great service to the community. We are an organization that refurbishes old computers and then gives them to disadvantaged kids in the Austin Texas area. The way we’ve adapted to using Linux in a Microsoft world is to include VirtualBox with our linux computers. It is a free application that allows you to run a full-blown Windows operating system within the Linux environment. It has worked well for us. It is easy to set up and scales well for even the biggest corporations. VirtualBox can be obtained at the Oracle website. Thanks for that info Ken. What are the advantages of running windows in VirtualBox as a guest os on Linux versus just running it as the native os? What are you gaining by doing that? Unfortunately, you have to install all your apps and software into your vituralbox Windows anew, but it works well for us. Another option is to run a program called Crossover. It creates individual Windows environments for each windows application. Works ok but is a bit limited in the Windows apps it runs. Crossover is the professional verion of an open source program called Wine. The crossover folks have improved it greatly though. If you like, you can email me helios at fixedbylinux dott komm and I can more fully explain some options available to you. One alternative, depending on your specific needs, is to use a web-based or intranet platform for that work. In the past, I’ve set up a non-profit client with CiviCRM (http://civicrm.org/). CiviCRM was originally designed to do political campaign management, but over time it’s been generalized, and now does the job very well for most non-profit needs. Plus, by running it on an well-protected intranet server, you aren’t exposing your accounting and donation software to the often virus-ridden jungle of a Windows desktop. @Josiah: I work for a Pennsylvania-based college campus ministry that runs Ubuntu for both server and desktop operations in our HQ. (Our field Staff use whatever they like, often Mac or Windows.) We’ve faced the same challenges you’re describing in finding donation and financial fund-accounting based software. We wrote a donation handling System called Grace (http://gracedm.googlecode.com) that we developed ourselves but released as open source software. It works on both Windows and Linux/Ubuntu, and does a good job for processing donation for our ~60-person organization. For fund-accounting, we use a web-based solution called FrontAccounting (http://frontaccounting.com/wb3/). It required a little customization to get the particular reports we wanted, but really works great! So I’d recommend checking out those products, both of which work wonderfully in an Ubuntu world. I’d also be very curious to hear what Rick Richter uses for Food for the Hungry! I’ve worked with CiviCRM in the past. It is interesting, but didn’t really fit the needs I run into last I looked. This was several years ago though. Tom, thanks for sharing your project. That looks interesting. If you’re going to ICCM (http://www.iccm.org/) you could maybe do a presentation about it. I’m working on plans to be there and it would be cool to hear more. The screenshots look good.